Meg Roberts grew up in Bismarck, North Dakota, working with her parents in their small ceramics business. She spent the first dozen years of her life traveling across the northern Midwest to work at various small town craft sales, but had no idea it would inform her studies at North Dakota State University as a ceramics major, subsequently graduating with a BFA in 2012. Roberts attended a short-term artist-invite-artist residency at the Red Lodge Clay Center in 2011 with NDSU Visual Arts Chair, Michael Strand, Amy Smith, Larry Pelter, and several peers. 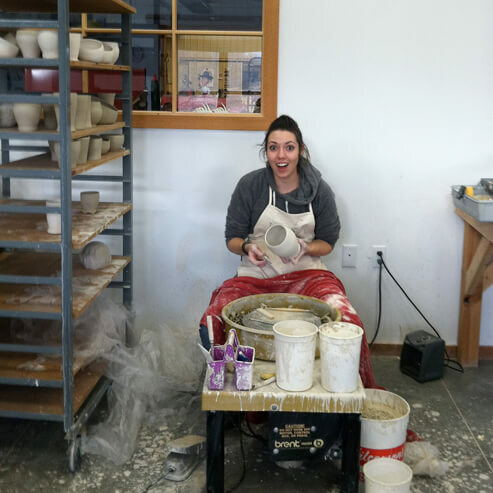 In 2012 she founded the nonprofit ceramic and social practice community program, Plants for Patients, and continues as a post-baccalaureate student at NDSU in Fargo, ND. Meg spends her time away from studio practice tending her apartment garden, working at a coffee shop and a womenâ€™s health center, and spending time with her partner and their two cats, Poeg and Fatty. Nestled comfortably in the rich history of social engagement and ‘craftivism’, my work exists at a tiny intersection between two vastly different worlds: ceramics and abortion care. Having been influenced by my undergrad mentors and other contemporary social practitioners, the work I do and make is intended to build community, interact with people in their daily routines and sow seeds of gentle compassion into a divisive social and political issue. One of the ideas that concerns me about the ceramics field is the lifespan of the objects we make. In a culture of consumerism I contemplate the implications of manipulating earth to the point of no return. Because of this I incorporate social practice into my work to create meaningful connections with those who acquire it.